Kistner F, Fiebert I, Roach K.
Objective: This study examined the effects of various backpack loads on elementary schoolchildren's posture and postural compensations as demonstrated by a change in forward head position. Subjects: A convenience sample of 11 schoolchildren, aged 8-11 years participated. Methods: Sagittal digital photographs were taken of each subject standing without a backpack, and then with the loaded backpack before and after walking 6 minutes (6MWT) at free walking speed. This was repeated over three consecutive weeks using backpacks containing randomly assigned weights of 10%, 15%, or 20% body weight (BW) of each respective subject. The craniovertebral angle (CVA) was measured using digitizing software, recorded and analyzed. Results: Subjects demonstrated immediate and statistically significant changes in craniovertebral angle (CVA), indicating increased forward head positions upon donning the backpacks containing 15% and 20% body weight. Following the walking of 6 minutes, the CVA demonstrated further statistically significant changes for all backpack loads indicating increased forward head postures. For the 15 & 20% of body weight conditions, more than 50% of the subjects reported discomfort after walking, with the neck as the primary location of reported pain. 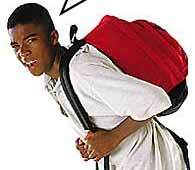 Conclusions: Backpack loads carried by schoolchildren should be limited to 10% body weight due to increased forward head positions and subjective complaints at 15% and 20% body weight loads.